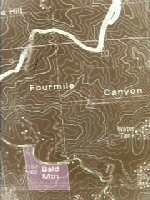 Fourmile Canyon Creek begins around the old mining town of Sunshine, descends through the foothills and enters the plains near what is now Lee Hill Road, then proceeding eastward to join Boulder Creek near 63rd Street. Also see 1916, 1950, 1951 and 1955 of History of Flash Floods in BASIN History. Note: The city of Boulder has conducted a new flood mapping study of Fourmile Canyon Creek's floodplain after discovering that the official FEMA floodmaps were off by four feet on a section west of Broadway near the mouth of the Canyon. The result has been that the size of the floodplain was underestimated by about half. The bridge at Broadway is built to handle about half of the flow of a 100 year flood event. What does "cubic feet per second" mean? It is our intent to build a comprehensive information resource based on the local watershed theme. One way you can help us develop this area of the BASIN WWW site is to take this quick survey. Your input is greatly appreciated. Do you have a comment or question about this area ? Select here for a more general BASIN feedback form.